My german shepherd likes to greet me with a toy in her mouth whenever i get out of bed and she makes a noise while doing it. what does this mean and why does she do it? i also have another question. whenever we come through the door she will get a toy and be noisy and hit us with her paw. why does she do this and how can we stop her from doing this? Total German Shepherd: You are so lucky! Your dog thinks enough of you to greet you in the morning and to encourage you to play a game. How sweet! Why would you not want to engage your dog when it thinks so highly of you? Isn't that why you got your German Shepherd in the first place - to be your companion? Your German Shepherd wants to play with you. And the vocalizations, well, GSDs are just a vocal breed - some more so than others. So play with your GSD - it's good exercise for you both, it's fun, and all the time you take to play with your dog will be rewarded to you over and over in the future. 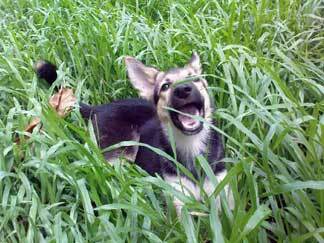 Dogs are very social creatures - they want to be with us and to interact with us - your German Shepherd is no different. Enjoy it while you can!